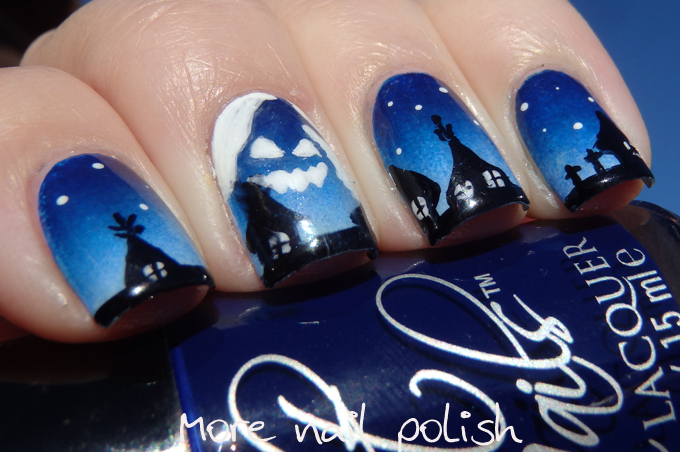 Remember how I was complaining yesterday about Halloween manis and feeling a bit over them. Well this is my last one! I was inspired by an amazing mani on Instagram by @tinas_polish. 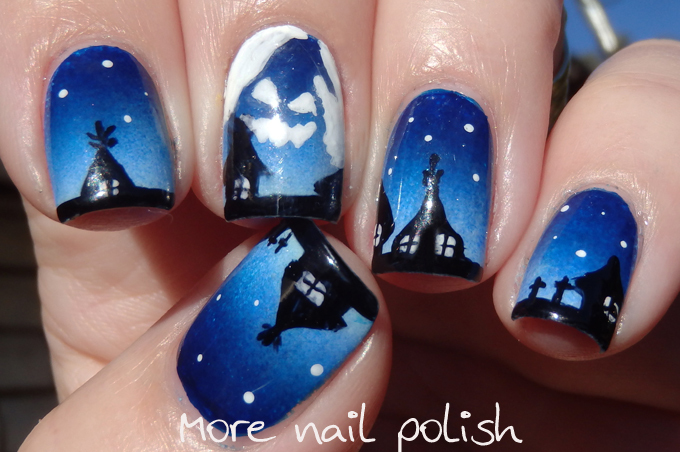 Her free hand nail art is really incredible and if you are not following her, you must! 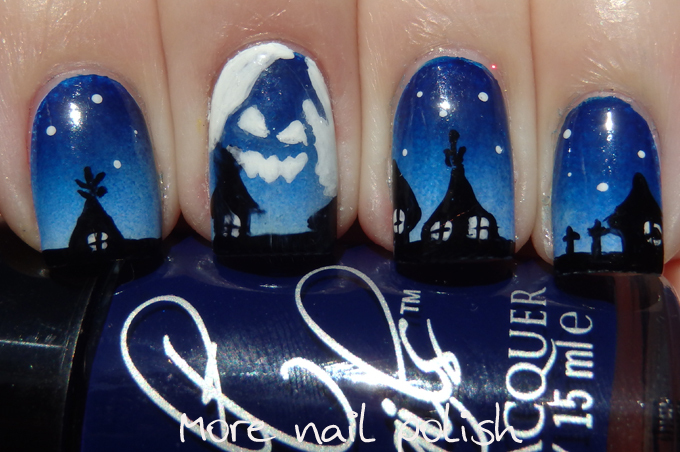 Most of this mani came together really fast, the gradient and the black buildings etc, but holy cow painting Oogie boogie into the sky was nearly impossible for me. I top coated the whole design and then painted that white part on with white acrylic paint, as I knew I could rub it off with some water. Lucky I did, because I must have tried to paint him 15 times! It's not even a patch on what Christina created, but I'm still happy with this for my Halloween mani! Don't forget any last chance entries to win a nail polish calendar. Entries close tomorrow night. Love love love the giant ghost! This is so cute! I think you did an amazing job on it. 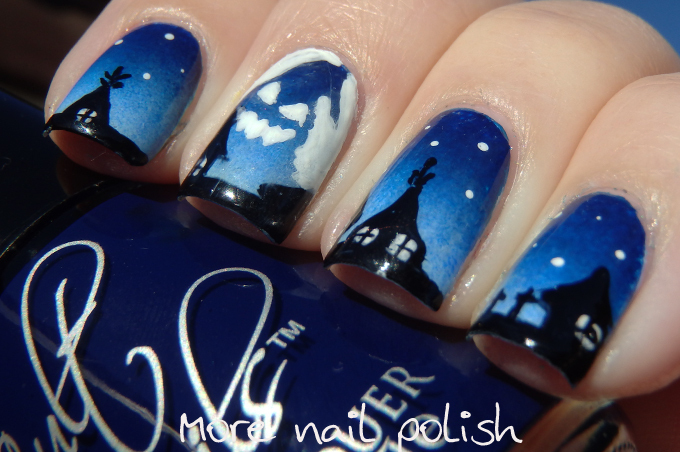 Really cool mani! I'm working on gradients right now. Could you tell me what you used to create your background gradient? It looks like one element is Cult Nails' Time Travel? Many thanks!